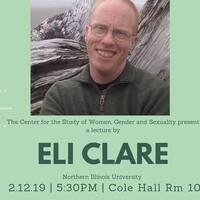 Come listen to Eli Clare use story-telling and poetry to examine the damage done by the notion of defectiveness. This event is open to the NIU & DeKalb community and anyone else interested in learning about the intersections of disability, race, queerness, and what is means to have a "bad body." *Cole Hall is an accessible building and we are working on accessing an interpreter. Please check back for updates or email wgs@niu.edu for questions on accessibility of the space. If you are coming from outside of the NIU community feel free to email for directions or questions regarding parking and accessibility.